The waft of grilling steaks mingling with the fresh outdoor air is almost intoxicating for the outdoor chef. Grilling outside quickly becomes a pleasant addiction, and it can lead to an explosion of fun and festive culinary feasts. When the culinary pleasures of outdoor cooking start to expand beyond what a lone grill and patio table can support, you should consider installing an outdoor kitchen. An outdoor kitchen feeds the hunger for the fresh outdoors, and becomes the fixture that brings family and friends together for enjoyable food and fun. The outdoor chef will have the means to prepare a variety of full-course meals for evening dinners, weekend parties, and holiday get-togethers – without extensive wear and tear on the patio door, and without having to leave good conversation for sauce stored in the fridge. An outdoor kitchen is not an inexpensive endeavor, but it will certainly increase the value of your home and provide you with a lifetime source of outdoor enjoyment. Being able to have the option of cooking indoors or out also breaks up the monotony of weekly meal preparation. A nice leisurely dinner in the backyard can be as refreshing as dinner out at a local restaurant. To plan your outdoor kitchen, you can start by making a list of what appliances you definitely want installed outside. The basics are a grill, sink and fridge, and it's easy to add a dishwasher and microwave to the list. 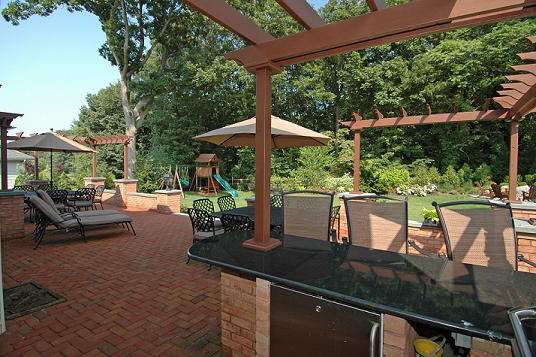 But if you want to design your dream outdoor kitchen, explore all of your outdoor cooking options. Stovetops, wood-fired ovens, pizza ovens, rotisseries, smokers, lobster boil drawers, warming drawers, ice makers, wine chillers, beer taps, and beverage centers are popular options. Start with choosing the best grill you can. There are many hybrid choices out there that offer a combination of cooking surfaces and cooking fuels. Finding one appliance that serves two purposes reduces your overall appliance, installation and utility costs. And don't forget to list the smaller appliances as well – blenders, food choppers, and coffee machines will need to be taken into consideration when planning counter and storage space. Once you create a list of appliances, you can better determine your counter space and storage needs. You will obviously need enough space to install the appliances, with extra measures left for safety requirements. Also plan storage and prep areas to accommodate a scenario of cooking for the largest number of guests you would expect at one time. The biggest difference between an indoor kitchen and an outdoor kitchen is weather. Cabinet doors should be sealed airtight. Stainless steel storage is almost always a safe weather-proof option for all climates. But if you're looking for a softer touch, there are many beautiful decorative materials created specifically for the outdoors. The potential effects of weather should be considered when determining the location for your outdoor kitchen, and when choosing appliances and fixtures. Everything will be exposed to, or need to be protected from, sun, wind, leaves, falling branches, rain, sleet, hail, and probably snow. Also, insect control is important indoors, but it takes on a whole new level when you're planning an outdoor kitchen. The location of your outdoor kitchen will also be determined by plumbing and electrical requirements. The closer your outdoor kitchen is to your house, the lower your plumbing and electrical installation costs will be. And as with any outdoor home-improvement project, you need to look into your local permit requirements and code regulations before you start building. Once the primary kitchen area is planned, expand your vision to include new seating and dining arrangements, an outdoor fireplace, and a place for after-dinner relaxation. 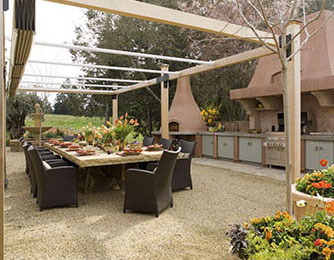 Your outdoor kitchen will evolve into a fresh new living area. But again, plan your outdoor living area for the weather and for insect control so you can maximize your year-round enjoyment. An outdoor kitchen will bring new life to your home. Your routines and menus will take on a fresh new aspect, and you'll find yourself immersing in the pleasures of outdoor cooking and outdoor living. Life outdoors will be simply intoxicating, and you'll never taste a better steak than the first one cooked on your brand new grill that's tucked inside your new outdoor kitchen.